Hurdle and steeplechase racing was once one of the staples of the raceday program in Queensland, New South Wales, Western Australia, Tasmania, Victoria and South Australia. From the history books it appears that the Northern Territory never introduced the sport and therefore it was never the subject of any 'ban' or otherwise. Jumps racing was introduced in the schedules of races run by Hunt Clubs in the early 1830s and was soon adopted by the various city race clubs. The early steeplechase courses featured post and rail and log fences, stone walls were common as were water filled ditches and steeplechase courses were added in and around the main racetracks. Nearly every racetrack had a dedicated jumps course where permanent obstacles remained - it was only in more modern times where jumps could be placed and removed between races that many of the inner jumps courses were removed. At the metropolitan racetracks the only recently remaining 'jumping lanes' were at Flemington, Moonee Valley and Oakbank (SA) but with the changes announced in Victoria the result was Sandown only having a specialist jumping circuit. Several Victorian country tracks such as Warrnambool, Casterton, etc also have jumping courses while the Melbourne metropolitan jumping was rescheduled to be concentrated at Sandown after the review in late 2008. Australia has had many champion jumps horses over the years with horses like Redleap, Redditch, Doiran, Fulham, The Feline, Mosstrooper, Winterset right up to Crisp being legends that are still discussed with some having a race in their name still run. Mordern day champs such as Sharp As, River Amos, St Steven and Karasi also made their name due to their feats over the jumps. Karasi was often behind the placegetters in the big Cup races but became a household name by winning the Grand Jump in Japan three years in a row and nearly attempted a fourth but a tendon injury in trackwork led to retirement. He along with St Steven have made numerous 'guest' appearances on racetracks in the last few years. The first of the four jumping states to cease racing over the obstacles was Queensland. In the 1890s the economic downturn & effects of the city flood disaster hit racing hard and while its carnival races had their prizemoney slashed the jumps racing disappeared from the calendar. Racecourses such as Bundamba (Ipswich) and a second course were not used for several years with one raceclub stopping meetings completely for nearly two years. The state racing industry only survived through the programming of small race meetings. The industry picked up again by 1899 but the jumps racing did not and by August 1904 hurdles were being run at Toowoomba but there was little interest. The sport did return briefly in the mid 1980s to early 1990s when a once a year exhibition hurdle was held following in the footsteps of Sydney and Canberra. These did not last long due to equipment, horses and jockeys all having to travel from Victoria resulting in small fields with the favourites usually winning by big margins however there were no notable incidents or injuries. Interest soon waned and jumps never returned to Queensland again as although never banned there wasn't the support for the costly exercise. Western Australia did experiment with a 'Perth Steeplechase' but it was only tried once in 1877 and never again while a hurdle racing did appear on a regular basis in the 1890s it was generally considered that with low prizemoney and small fields it would not be sustainable long term. While it survived early predictions once the depression occurred in the early 1930s the sport slowly declined in stakes and significance and eventually disappeared. Like Queensland it was economics not a ban that ended the sport in that state with the clubs having problems attracting entries for what was to be the opening race of the 1941 season on July 5th but it was deleted after not enough entries were received to make the race viable. Even if their had been enough horses there was also the issue of enough jockeys with the best already well established in Victoria for the longer and more lucrative season or many others signed up to fight in World War II. New South Wales tried to keep the jumps races going but as few of the country tracks (aside from courses in the Riverina which were accessible by Victorian trainers) the interest and pool of jumping horses was quite low by the 1920s. And by 1931 the rules allowed a horse that had lost its jockey to be remounted and ridden to the finish by racegoers if it was still possible to claim a placing. There were also allegations of corruption within the jockey ranks and this didn't help the image of jumps racing with the racing public. Various incidents, small fields and the overall poor quality of jumpers in NSW (for the big races the superior Victorian jumpers often came and took the prize from the locals) brought about the end of Steeplechase races in 1931. Hurdle racing continued on until 1941, despite the small fields, when it and midweek racing were suspended due to World War 2. Despite assurances it would return after the war it was never revived. In November 1985 there was an annual exhibition hurdle race at Rosehill and while it race itself was a success with no incidents and went on to continue for a number of years like Queensland the interest didn't justify the cost of importing the equipment, horses and jockeys from Victoria and it was consigned to history in the early 90s. For unknown reasons at the time in 1997 the Greens introduced a bill in regard to making it unlawful to run a steeplechase or hurdle in NSW (click here for link - please note you have to go about halfway down the page it was put through with making it an offence to confine birds by a leg ring and chain on the same bill). Linking it with confining birds via a leg chain may have swayed some votes from members who believed it was a dead sport at that time so didn't matter (it was 19 v 17 votes) and strangely the following bill to outlaw steel jaw traps in NSW was not passed. 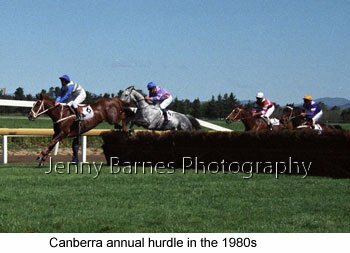 Canberra briefly introduced a once a year hurdle race at its Canberra Cup meeting in the 1980s with the final version won by Cobbler Boy in 1988 (photo of this race is below). The races themselves were incident free but after an after race scandal over the event one year the interest waned and the club went to an all flat race program in 1989. Finally Tasmania's racing industry started to struggle in the years leading up to jumps racing ceasing in 2007. Track and race club rationalisation was put into place and as jumps racing the previous year consisted of only 19 horses (only 7 were from local stables the rest from Victoria) competing in 6 races. Even the jumps had been imported from Victoria. Again an economic decision - the sport itself was not banned. The final two remaining states that still at this stage have jumps races are Victoria and South Australia. In Victoria several years ago small yellow jumps were introduced to placate the various protest groups who were extremely vocal in regard to falls at the metropolitan jumps race meetings. While the first season or so the new jumps did show promise and improved the falls statistics unfortunately as many predicted the horses soon learnt they could just gallop over the obstacles at a greater speed by skimming through the forgiving brush. This led to mistakes and ultimately greater chances of race falls and injury. After a review in 2008 many improvements such as raising the angle of the obstacles and ensuring white sighter lines on the takeoff side plus many other recommendations and in 2010 new fences from France were introduced and were well received. In South Australia the same type of blue brush hurdles have been used since 2000 and jumps racing itself had no fatalities from the end of April 2003 to May 2008 - a five year stretch that many condemning the sport are either unaware of or not prepared to acknowledge. In the second half of the season the Victoria yellow modular jumps were introduced and while there were no issued the blue hurdles were back in 2009 with extra padding on the takeoff side and white 'sighter' lines both to increase the safety. Due to the low number of steeplechases outside Oakbank a number of different fences have been tried with 2011 seeing the introduction of new blue steeplechase fences while Oakbank has replaced the jumps seen below in the photos of Moon Chase, St Steven etc with live hedges as jumps which encourage the horses to respect the obstacle while being forgiving if they make a mistake. Its often said by detractors from the sport that horses are simply 'delaying the inevitable' and have no future after racing over jumps but this couldn't be further from the truth for most competitors. Above are two examples of horses that raced over jumps for only one or two seasons that I personally have noted as having very long careers in the equestrian arena. 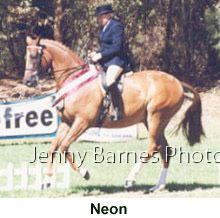 Flagstaff retired after 9 jumps starts for 2 wins in 1994-95 and in the next few years became a champion show horse renamed Neon with top rider Charlotte Mitton based in South Australia - over many years when competition was extremely strong in the hack arena he was always winning Champion or Reserve Champion at the big events. Central Park first came to notice when he was entered in the 1999 Melbourne Cup Hurdle and there was confusion with a horse of the same name from overseas he ultimately didn't run in that hurdle and by the following year he was retired. 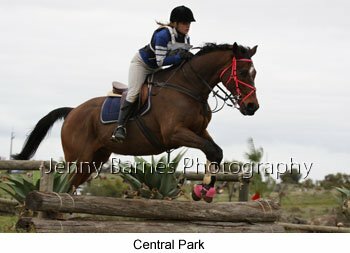 Central Park was then purchased for a pony club rider and turned up at the Pony Club showjumping at the 2002 Adelaide Royal and since then has continued to build the confidence of his young riders with the photo above from 2008. The extra training involved in preparing a horse for jumps racing certainly gave Central Park the skills to continue on. Other recent Royal Show Champions such as Flawless (who raced as Tannice and had a long and successful career as a hack) and Stage Lyric (raced as Palazzo Musicale) had very short jumps careers before moving on to equestrian, Tembo Tembea was best known for winning two jumps races during Melbourne Cup week before going on to be a high level eventer under the CP Vavoom, Torchbearer went from good flat race performer to having a couple of starts over the hurdles before starting a long career as a showjumper, Murph was a talented country cups performer in Victoria before racing over jumps including Oakbank and then went on to a showjumping career where he won the South Australian State Championship for Kristy Bruhn and these are just a few examples of many horses that go on after a jumps career. Would they have gone on regardless? well that is harder than it seems as even the shortest of jumps careers involves a lot of extra training and putting the horse in different situations while learning to jump before even getting to raceday which makes the change to equestrian all that much easier with the additional skill that the horse does not have to be trained to jump completely from scratch if the new owners want to try showjumping or eventing. 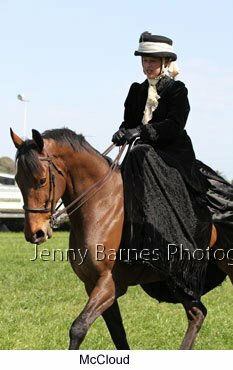 McCloud raced over the jumps and after racing moved into an equestrian career including hunting and side saddle. While it may appear only a tiny number of the very best horses have a career lasting more than one season when you look into various runners its quite amazing how long they continue to perform over jumps often longer than their flat racing counterparts (though obviously many of the better known flat horses tend to get sold overseas or go to stud instead of returning year in and year out). 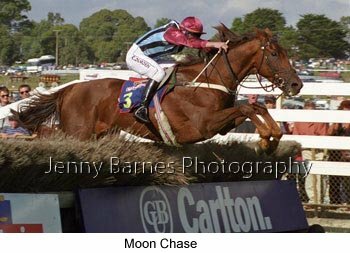 Moon Chase (pictured below) had a fairly short career of only 4 seasons but in that time he proved the best around winning 11 of his 19 jumps starts and when weights became too high his connections immediately retired him. 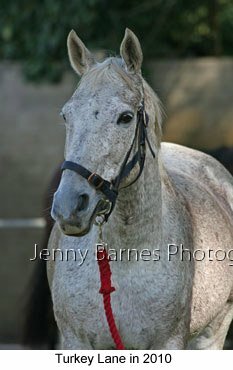 He was sound and could have raced on but they wanted to look after the horse who had made his name over the obstacles. 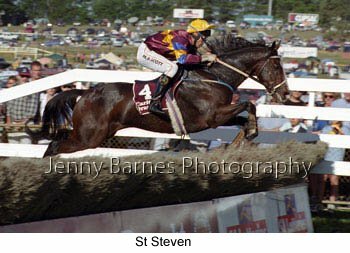 St Steven (pictured below) was another star over the jumps and included a Great Eastern Steeplechase, the Grand Jump in Japan and even a race named after him amongst his wins. He had 32 starts over the jumps for 10 wins and created a prizemoney record for a jumper during his 7 seasons. Some Are Bent is another superstar that created his mark with a career of only 4 seasons and 25 starts for 12 wins before being retired and by all reports is happily enjoying his life in the paddock. Weeping Willow is also enjoying retirement on his trainers property after racing over jumps for 5 seasons with success without being a superstar while Conzeal (pictured below) who had 37 starts over jumps in 6 seasons moved on to a career showjumping. 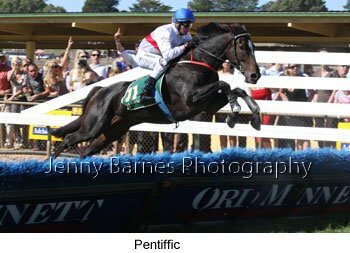 Real Tonic was another who raced over jumps for 7 seasons winning the Great Eastern, Grand Annual and Great Northern Steeplechase (in NZ) treble in 2006 amongst his 37 starts before being retired. South Australia has had many old campaigners who returned year after year before heading for retirement Ryazan had 45 starts over the jumps over 7 seasons and was a showjumper well into his older years while Voodoo Sunset after a long career on the flat then had 16 starts over jumps for 6 wins and is still active now as one of the Tafe SA horses. 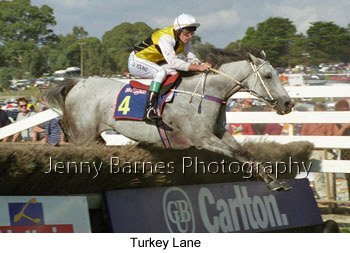 Turkey Lane who won the Great Eastern Steeplechase at Oakbank had 47 starts over jumps over 6 seasons and as can be seen below returned to make a guest appearance & lead the field out in 2010 at Oakbank while Just Dynamite, another Oakbank regular, had 59 jumps starts over 6 seasons. 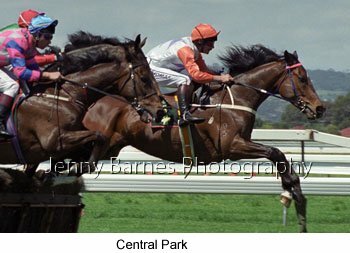 Yet another SA horse was Noah Yarn who raced over jumps for 7 seasons recording 54 starts for 5 wins and 12 placings while another horse Cash On was on the scene a little earlier than most mentioned here but he had 64 starts over jumps for 8 wins and 18 placings before being retired in 1997. These are just a few examples that I could think of from a small group of regular competitors in South Australia there would be plenty more that have remained in Victoria. Many jumps race horses are actually bought by the jumping connections from owners in NSW & Qld who no longer want the horse either privately or via bloodstock auctions. Ginolad was widely reported as being sold cheaply to his Victorian jumps stable and after winning the Grand National Steeplechase and Grand Annual at Warrnambool for his young trainer in 16 starts over jumps he was considered good enough to be sent to the UK for the English jumps races. 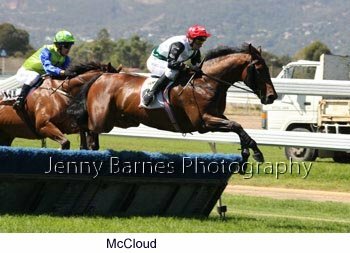 Moon Chase was another that had previously raced in NSW before being sent to a jumps career in Victoria and even the 2011 winner of the Brierly Steeplechase and Von Doussa Steeplechase was sold from NSW to his Victorian jumps connections. 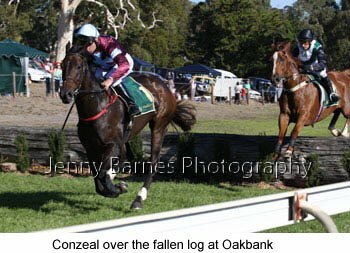 2010 & 2011 Grand Annual winner Al Garhood is another horse who was sold from NSW when he was an unwanted 3yo and over the next 7 seasons has 11 race wins over the jumps. While many horses are tried (and some rejected) as future jumpers some horses have always had a jumps racing future ahead of them. 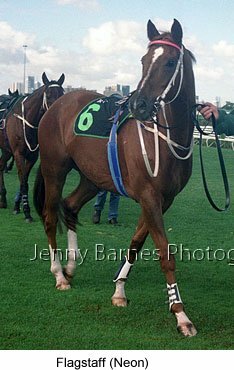 In the early 1990s a horse called Sharp As mixed jumps racing and flat racing and was only out of a place in a Listed country cup event while far more recently Pentiffic (pictured below) was always heading for a jumps career. 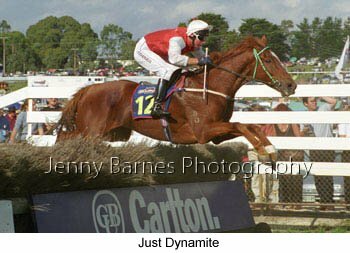 After an initial preparation as a 3yo he was spelled and the following winter began his jumps career and in 10 starts over jumps he recorded 5 wins including the features Yalumba Hurdle at Oakbank and Grand National Steeplechase. The following year he was being prepared for the Grand Jump in Japan but injured a tendon in the lead up to the race. He was scheduled to be flown to England for further treatment which if successful the plan was to aim at the big UK jumps races. Even in the UK where they have National Hunt stallions many of those are former flat racing stayers so the theory that overseas horses are 'purpose bred' for jumps racing isn't really that convincing when it comes to Australian horses as the fact they just come from bloodlines more along the lines of stayers (and you will often find stout staying lines in the breeding of many jumps horses anyway). In Melbourne there have been a lot of changes over the last 10 years or so in their jumps. After campaigning by a small vocal group who would protest inside the racetrack near the outside rail in the late 90s Victoria eventually decided to change their obstacles to yellow modular jumps. Initially though many had doubts the older jumpers handled them well but over the next few seasons the newer horses went faster and mistake were made which took its toll on new and established jumpers alike. Despite three versions of the yellow broomstick jumps being tried over a number of years after a disastrous season that resulted in a high level of fatalities the authorities in Victoria purchased new jumps from France for the 2010 season onwards which had an immediately effect in a noticeable reduction in deaths and injuries as horses started to respect the obstacles again and jump them rather than skip over the top with an extended gallop stride. In South Australia the obstacles were changed in 2000 to a newer hurdle topped with blue brush. This type of jump proved an obstacle that horses respected while it would give and even fall flat if hit hard enough - the fact that Adelaide went without a serious injury using these jumps for 5 years from 2003 to April 2008 proved it was the right decision staying with its own jumps and not following Victoria. 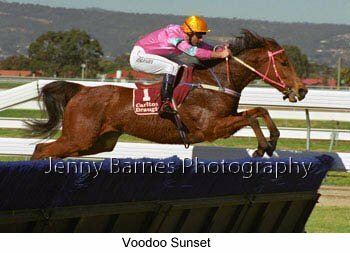 The same jump was used up until May 2008 when under pressure from Victoria to entice Victorian horses across the border SA switched to the yellow modular jumps. These were only used until the end of the 2008 season and didn't not cause any problems as the local horses didn't have time to learn not to respect the new jumps. From the start of the 2009 season the blue brush topped jumps were back but had padding added to the takeoff side plus white sighter lines to improve safety. 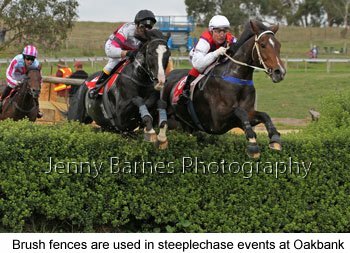 The steeplechase fences have changed over the years with the fences seen below at Oakbank being replaced with the yellow ones from Victoria while the club was growing the hedges at each jump. With no issues since 2003 over the steeplechase fences whether they were the older style seen below or the yellow topped modular ones that were used in the interim the club has made the changeover to all jumps being live hedges. Hedges are thought to garner respect from horses as obstacles as well as offer plenty of give if a mistake is made giving the horse a chance to recover its footing. At other courses 2011 saw the introduction of new blue topped steeplechase fences whish have plenty of padding & sighter lines on the takeoff side and look solid to horses so they jump rather than trying to brush through. The jumps now being used don't look all that much different to the ones used at various New Zealand courses (I saw one course that had green brush topped jumps that had a base that looked only a little more solid than the SA blue ones) excluding Ellerslie and its impressive huge brush course. Aren't there massive numbers of deaths each year from this type of races? No - in fact compared to all horse sports the numbers are comparable often lower. All equestrian sports carry risk to participants and every incident leads to a full investigation into exactly what happened and how to make the sport safer. In South Australia in 2013 and 2014 there were no deaths in jumps races and in fact in 2013 there were no falls just one horse that dislodged a rider in the final race of the season. In 2012 in South Australia there were no deaths in hurdle races either. The risk is always there and no horse sport can guarantee there will no incidents but safety improvements pushed from within the racing industry has made the sport safer over recent years. If incidents are comparable why dont the equestrian sports make the news? Due to the lower profile of horse sports in Australia the main news outlets wont worry about most incidents in horse sports. They will show footage of any spectacular falls at the occasional international event such as the Olympics but unlike Europe equestrian doesnt have the profile here. On the day everyone is more worried about the connections and unlike racing there is no wall to wall coverage on tv to attract the attention of activists. There is no administering authority that reports on the status equestrian horses like you will find in racing. References used for this article - History of Australian Racing Vol 1 2 & 3, AJC The Principal Club, Australian Horse Racing Jack Pollard, Racing Victoria website, Australian Race Results and the National LIbrary 'Trove' online newspaper archive resource.